Anthony Watts, a long-time denier blogger, is pushing the notion that Albert Einstein would likely have been a climate skeptic. Really? Resorting to impugning the integrity of a long dead scientist to justify his anti-science propaganda? Anthony is claiming that Einstein would have been a fake sceptic or worse, a science disinformer, a liar denier, like Anthony himself is. That's a big idea and one for which he offers no support. Oh he posted an article underneath his headline, which was written by some bloke called David Shapter, or was it Will Happer? Einstein did make an effort in his scientific work to justify his conclusions. Not so climate science deniers. Their arguments are by assertion, with no evidence supplied apart from a relying on a couple of dubious quotes (with no references) and which, in any case, have nothing to do with climate science. Deniers don't like evidence (it's all but prohibited at WUWT for obvious reasons). 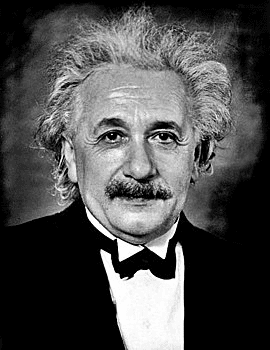 Albert Einstein would almost certainly have been a global warming skeptic if he were alive today. Many distinguished, contemporary scientists are skeptics, too. We are lucky that Einstein left a rich legacy of pithy quotes that reveal how he would probably relate to today’s cult of global warming alarmists. What sane person regards science as a "cult"? What "distinguished, contemporary scientists" are also deniers? Well, Will (or David) doesn't say. Certainly no reputable scientists who study climate reject the notion that global warming is happening and we are the cause. Dear Grossmann, This world is a strange madhouse. Currently, every coachman and every waiter is debating whether relativity theory is correct. Belief in this matter depends on political party affiliation. pochas94 points out that at WUWT, irrational is fashionable. Hard to disagree. The irrational has become fashionable. benben points out that WUWT has gone even further downhill. Haha wow WUWT is becoming worse by the week. Haven’t read any halfway decent scientific stuff here in months. Reality catching up with you guys? Ah “benben” the he/she/it who is so virtuous that he/she/it has to hide behind a fake name and a made-up email (with “spammer” as part of the name) to hurl insults and protect a fragile ego from retort. Forgive me when I say “I don’t give a damn what you think”. Feel free to be as upset as you wish. Einstein to Marcel Grossmann in The Collected Papers of Albert Einstein Vol 10 (eds Buchwald, D. et al.) 271–272 (Princeton Univ. Press, 2006). It never ceases to amaze me when deniers invoke elementary school characterizations of Einstein, Galileo, etc. And it's even more amazing when they go on to give sophomoric lectures to practicing professionals on the scientific method (usually some simplistic hypothetico-deductive idea from the early 1900s) and on how to make scientific inductions (usually involving the necessity of experiments in a nonexperimental area). The combination of sheer ignorance and immense arrogance is astounding. I believe Svante Arrhenius would have been the director of the Nobel Institute when Einstein was awarded the Nobel Prize in 1921 for his work on the photoelectric effect. It's plausible that Einstein was aware of Arrhenius original theory of AGW. No idea what Einstein might have thought of it. It's strange that the same people who always insist that Einstein or Galileo would have agreed with them, are the ones crying "argument by authority" if you suggest most scientists disagree with them. I doubt very much that Einstein would have been a denier - but if he was, so what? He was wrong quantum mechanics, he would be wrong on global warming. I call this logical fallacy "Appeal to Feynman". Does this Anthony Watts fellow really think people are so stupid that they would believe his nonsense? I've no doubt Einstein would have been a sceptic. What he wouldn't have been, of course, was a denier. One wonders how many climate deniers would have been Relativity Deniers, and indeed how many actually are today. Yes, Einstein was notorious for the work he did on behalf of the tobacco industry, denying the impact of smoking on health. It was the politically conservative who disputed relativity, which is the same as climate science deniers today in the USA, at least. (And in Australia to a lesser extent.) It's ironic that deniers today are calling on dead Einstein to support their disinformation. He wouldn't. If he were alive today I don't think he would have made too many pronouncements on climate science, being outside his field. I'm not aware of him having done so back when he was alive, and I don't think he bought into topics like evolution either. He just accepted biological science as it was at the time, including evolution. Anthony's right. His blog caters for the stupid, as well as for those who aren't stupid but are intellectually disabled (their ideology interferes with their brain function so it doesn't work as it should). As Einstein's letter shows, and utterly bizarrely to modern eyes, relativity was in fact treated to the same political attacks then as climate science is now. My impression is that some of Einstein's work, I think the General Theory, was much more controversial at the time of publication than Darwin's Origins of the Species was at the time it was published. Einstein was, say, a Quantum Mechanics "contrarian" (he did not deny QM of course). But Einstein (and Podolsky, Rosen) actually did construct insightful arguments to try and falsify QM. But the climate change deniers... I have yet to see a single well-constructed argument against AGW from them. Well, of course you and I and many posting here *think* that just because Einstein was a first-rate physicist and a deep, careful, humble intellectual he wouldn't have been a climate change denier. "Tony, love your website and the way you always get under those libs skins about there phony alarmism! I never took any grant money when I was working and I was a much better scientist than Mann. I even wrote papers showing all the errors in the fake hockey stick and why the so-called greenhouse violates thermodynamics but pal review is keeping them out of all the journals... even Annalen der Physik. LOL... guess I should have thought about that before faking my death back in '55. Hope you'll be at the next Heartland meeting, Feynman and I have a big announcement about why Co2 can't control temperature. the “No amount of experimentation can ever prove me right. A single experiment can prove me wrong.” quote is particularly ironic for a blog that has repeatedly posted articles questioning whether the rise in atmospheric CO2 is anthropogenic (observations conclusively show the natural carbon cycle is a net carbon sink). “In order to be a member of a flock of sheep, one must, above all, be a sheep oneself!” is all very well, but goats can be geniuses or they can be crackpots, but the geniuses are very, very rare. If you are going to make a big deal of being a goat, it is probably a good idea to make sure you aren't a crackpot. Dear Anthony, This world is a strange madhouse. Currently, every ex-TV weatherman and every blogger is debating whether the theory of climate change is correct. Belief in this matter depends on political party affiliation. Science stupidity is obviously alive and well at the low-brow clown circus over at WUWT - the echo-chamber of fools and idiots. I never bother to visit this disinformation source for anything. I don't know anybody else that does either. Richard Carrier has written an interesting book, Science Education in the Early Roman Empire, which reveals that religious hatred for science and facts held back civilization for over 1000 years. WUWT is trying to do the same thing - while utilizing the benefits of science at the same time via the Internet. The hypocrisy is astounding. Anthony missed the opportunity to point a real live denier of Einstein's theories of relativity? Climate crank Roger Tallbloke. >Dayton Miller performed thousands of tests with his interferometer equipment to quantify the ether drift on Earth’s surface. >His tireless work spanning 30 years was buried by mainstream astrophysics in favour of Einstein’s theory of General Relativity. In 1931 a book was release, called 100 Authors against Einstein. These 100 authors were resisting Einstein's insights into relativity. Einstein's response was "Why 100? If I were wrong, one would have been enough." Einstein would have said the same thing about the science of 'greenhouse' gases and their impact on warming the planet. He's have said that one would be enough, and yet we have not a single black swan in sight. There have been plenty of white swans painted black by denialists, and ducks proffered as swans, but when it comes to any and all challenges to date every single one has been roundly and soundly refuted. Nothing that the denialists can come up with can hold water, and Albert would have taken great glee in pointing this out. Further, the fact that he said nothing to challenge Tyndall - or Arrhenius, or Callendar - is worth taking into account: he obviously saw nothing contemporaneously that was controversial. I can't resist pointing out that Einstein never said that. It is a straw man version of something he did write (in German) about the truth of theories, and how they can never be proven true. Abe Lincoln has backed up his opinion about Einstein. They were personal friends? Or Watts is back at the Ouija Board? About Will Happer: This is a story that I hope will be broadcast. Please bear in mind it's a second-hand story and may not be a perfect rendition of what I was told and later teased out by asking my father. A physicist friend of ours at Princeton was cornered by Will Happer at a departmental cocktail party. Our friend is a US citizen (born here I think) of oriental extraction. Happer was spitting mad and must have been a bit drunk. He carries a chip on his shoulder ever since he heard a department leader - it may have been discussing his possibility for tenure - made a stupid racist remark about how all southerners are not too bright. (Granted, totally unacceptable.) Happer rages against the Yankee (US northeast) "establishment". He suggested to our friend - who said it was the first time he'd felt unsafe here in the US - that "they" were going to get rid of all the furriners. He further said that "we" have all the guns and are arming to take back our country. This is "second amendment solutions" with a vengeance, and, unfortunately, is all too true of a significant but small minority here, who have acquired perfect legal large armories and plan to execute vigilante justice. Non US people may justifiably feel that my country is a terrible bully and has lost its mind. But believe me, a majority are grateful for traction gained by the leadership of the teenagers from Florida. Interesting that this kernel of power appeared in a red state in a public school - a remnant of a fine educational system that Republicans are eager to dismantle. Time and facts have made the line of sneer less popular than it used to be, at least at the NYTimes, though Revkin seems to have enabled them.